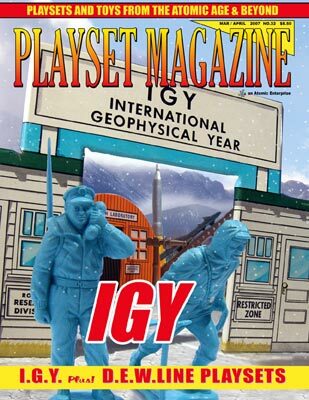 With much of the country caught in Winter's icy grip, it seems like a short walk up the street would bring us right to the front gate of the IGY Arctic Satellite Base as pictured on this issue's cover. Full color photos of the Marx IGY and D.E.W. Defense Line Arctic Satellite Bases grace the pages of the feature article. Companion pieces cover similarly themed playsets and carded items from Marx, MPC and Robert Simpson Ltd. (Arctic Missile Tracking Car). You'll also get the new product reviews, more voting on "The Greatest Playset" and much more. Last but certainly not least, we remember our dear friend and Marx legend, Frank Rice who passed away recently. His love of, and enthusiasm for toy soldiers and playsets, combined with his interest in history was the creative guiding force behind many of our most treasured Marx playsets. He will truly be missed.